Hello and welcome everyone to Burdeen’s Jewelry’s NEW blog. In this, our maiden voyage into the blog-o-sphere, we’ve decided to discuss the ever important and popular “Black & white” palette, as it pertains to fashion and more specifically jewelry. Over the years jewelry and fashion trends have come and gone. However, there are those few staples that every woman possesses (or strives to) that will forever be a part of her wardrobe and persona. “Black and white” jewelry and clothing is exactly this sort of staple; and they show no sign of ever becoming irrelevant or obsolete. As pictured above; Natalie Portman; famous actress; is demonstrating just how versatile a pair of black enamel and white diamond earrings truly are by wearing them with a more casual hairstyle and a semi-formal shell blouse. As most people are aware, the shades of black and white truly do “go” with everything. These same earrings could easily be worn with a little red dress, a perfectly tailored suit, or even a classic white T-shirt and jeans. Here at Burdeen’s Jewelry we offer many different style and articles of jewelry that fit the “Black & white” profile. 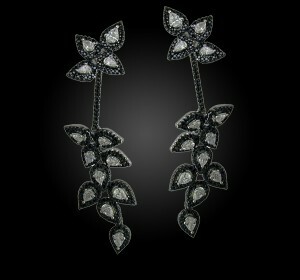 Pictured below is an original pair of Burdeen’s black and white diamond striped hoop earrings. And what woman would not love to own a pair of earrings that not only “go” with everything, but will be beautiful and contemporary for a lifetime?!? !